Mississippi's entry was situated south of the Iowa building and east of New Jersey. It was used as the headquarters for visitors from the State of Mississippi. Reproduced as a copy of `Beauvoir,' the old-style southern mansion bequeathed to Jefferson Davis on the gulf coast by Mrs. S. A. Dorsey (The Confederate President spent the last years of his life there), it measured 90 by 90 feet and cost 15,000 dollars. It was built entirely of Mississippi lumber, the contractor was J.F. Barnes, of Greenville, Miss. The Mississippi building house a considerable number of artifacts from Davis' life, loaned by the widow of the President of the Confederacy; of note was: a hundred year old piano, punch bowels, sideboards, etc. Included was Davis' suit of clothes that he wore when he was captured by General Wilson, in Georgia at the close of the Civil War; the object of the exhibit being to disprove the report that to hide, Mr. Davis wore a woman's dress when arrested. The library, bedroom and dining hall were almost intact, with furnishing coming from "Beauvoir." 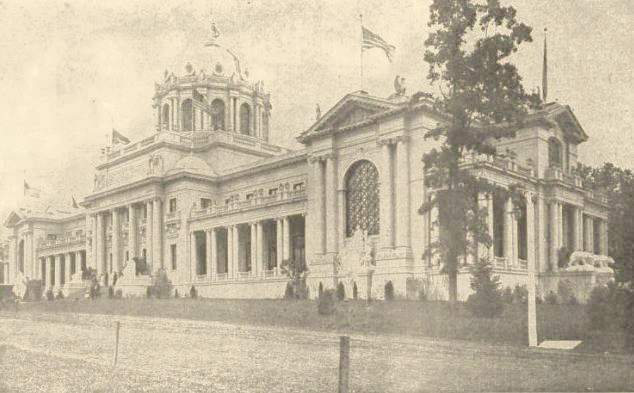 In the Palace of Agriculture two exhibits were shown, the special cotton exhibit, including the 35-foot statue of "King Cotton," and the vast collective agricultural exhibit of: cotton, corn, cereals, grains, hay, grasses, potatoes, peas, beans, syrups, honey, wines, cordials, preserves, pickles, jellies, canned goods, vegetables, oysters, shrimps, crabs, fish, etc. In the Palace of Forestry, Fish and Game, the state showcased over 500 samples of highly polished timber, superbly finished, one of the largest and best collections shown.